This season, the team looks to replace the production of the departed J.T. Noone. WALBERT YOUNG TTN Junior forward Tyler Witmer confronts a Penn player in Saturday’s scrimmage at La Salle. The team attempted four shots in a scoreless draw. The men’s soccer team is young, but coach David MacWilliams is confident. The team is preparing for its 11th season under MacWilliams, and he is fielding a team of mostly underclassmen. The youth movement for MacWilliams is challenging, but he has faith they will have a good year if they keep things in perspective, he said. The Owls prepared for the regular season with an exhibition match against the University of Pennsylvania on Aug. 28 with a 0-0 draw. Neither team was the aggressor in the contest with only four shots taken, but it allowed MacWilliams to see what his team needs to work on leading into the regular season. The team looked sloppy in warm-ups and played that way in the first half. The defense had a few lapses throughout the game, which Penn was unable to take advantage of. The strikers had few chances to create chances. The bright spot of the game was the midfield play, led by sophomore transfer Cody Calafiore, who had a great game in the exhibition. 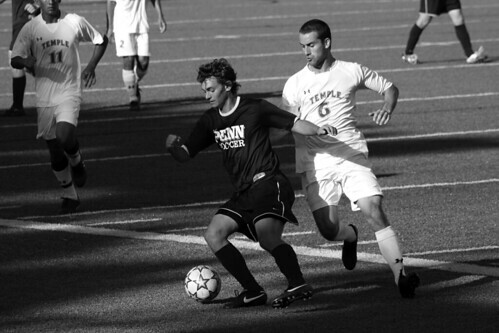 The Owls will rely on the play of junior striker Tyler Witmer, who has led the team in scoring over the past two seasons. The Wernersville, Pa., native scored six goals last season and was named to the 2010 preseason All-Atlantic Ten Conference team. Midfielder Jared Harris, one of only four seniors on the squad, and Witmer were named captains for the 2010 season. The Cherry and White also return the starting goalkeeper from the past two seasons, senior Bret Mollon. Mollon, who recorded six shutouts last season, led the A-10 with a 1.04 goals-against average. In 2008, Mollon led the conference with nine shutouts, tying a single-season school record. MacWilliams has nine freshmen on the squad this year, including Preseason All-Rookie team selection Vaughn Spurrier. Spurrier joins the Owls from St. Ignatius High School in Cleveland, Ohio, where he was named the 2009 Ohio State Player of the Year after he led his team to the state championship game. Spurrier has been given the opportunity to start right away for MacWilliams. The Owls are playing without star midfielder J.T. Noone, the all-time assist leader in Temple men’s soccer history, who is currently under contract with the Major League Soccer’s Philadelphia Union. During his four-year career, the midfielder accounted for 50 points, with 12 goals and 26 assists. The legacy Noone has left at Temple will be tough to replace. In all, the team lost nine members from last year, including four starters. Witmer will be asked to provide the offense and to use the same creativity left by Noone. Noone was able to set up Witmer for several of his scoring chances the past two seasons, and the duo had great chemistry on the field. The Owls are still trying to find ways to get the ball to Witmer’s feet, including a brief stint with Witmer playing center midfield behind Spurrier during the exhibition. MacWilliams is looking for Witmer to do what he does best: score goals from all parts of the field. The team will compete at home nine times in 2010, including the home opener against city rival Drexel University on Sept. 11. The Owls were successful at home a season ago, finishing 7-3-1 at the Ambler Soccer Complex. Last year’s team finished 4-4-1 in the conference, just short of an A-10 Tournament bid. The Owls will look to benefit from the home-field advantage again this season, as four of the final six conference games are at home. The Owls open up the season on Sept. 3 in Easton, Pa., against Colgate University in the Lafayette Tournament. In a vote by the league’s head coaches, the Owls were predicted to finish seventh in the A-10. Saint Louis, last season’s conference champion, was selected to once again win the regular season title. The Top 6 teams in the conference make the A-10 Tournament, which leaves the Owls just outside the tournament. MacWilliams doesn’t mind the underdog role. Owls were swept in three games in the home invitational. Tandoor India Restaurant introduces patrons to Indian food to the culture and its varied cuisines.